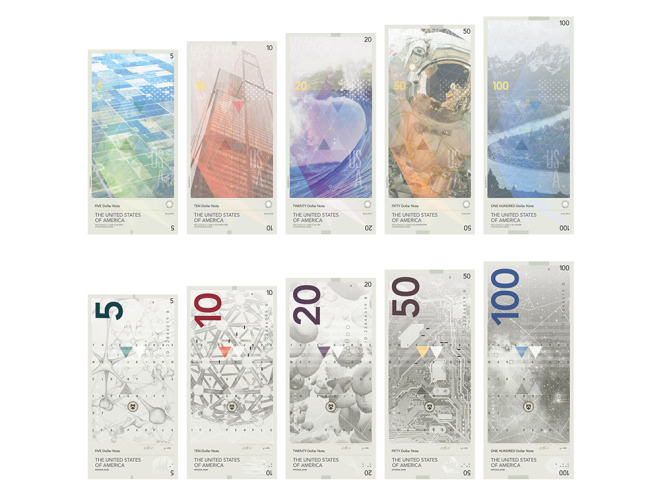 For my third blog post I have chosen the 100 dollar bill from the “What if our money were designed to celebrate science instead of presidents” article we have discussed many times in class. One of the very first thing that catches my eye is the size of the 100 in comparison to all the other bills. They are all sized to scale from lowest bill being the smallest and the highest bill being the biggest. That only adds density to the bill. It feels like more and looks like more. The second item that catches my eye on the side of the bill with the mountain ranges and meandering stream. The stream gives the bill a sense of motion a implied depth perception which I really enjoy about the bill it makes me squint and want to look deeper into the mountain ranges. What also helps with the depth is the color density at the bottom of the bill and fades away as you look deeper into the bill. Blue is a great choice for the piece because it can represent water and snow because water is a form of snow. The next item on my list of eye candy is the two differently colored blue triangles placed symmetrically in the middle of the bills, these are not the only triangle shapes throughout this entire collection of bills every bill has implied triangles all over. Just not as prominent as the main two triangles on each side. I really enjoy how they have almost all of the typography located in one general region of the bill, it makes it easy on the eyes. A crucial item for every bill is its numerical symbol I really enjoy that on the side with the most noise and graphics they keep the 100 small simple and quiet, where on the opposite plain side it is loud and easy to read. The overall balance this bill demonstrates from the front and back of bill is amazing. Finally the overall idea of switching from famous presidents faces to scientific discoveries and images actually represents our country better. It show progression in society and technology as well the beautiful aspects of our country as well.